ASSIGNMENT OUTER SPACE (1962) Rick Von Nutter, Archie Savage. Pure sci-fi with excellent Cinematography. A gigantic force field on a runaway space station threatens Earth. Very atmospheric with a terrific ‘50s sci-fi stock music score. Color, from 16mm. 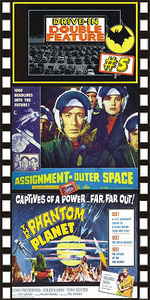 Plus: THE PHANTOM PLANET (1961) Dean Fredericks, Coleen Gray, Dolores Faith, Anthony Dexter, Francis X. Bushman. An enjoyable, underrated sci-fi 'B' opus about an astronaut who's stranded on an invisible planetoid. There, he finds a race of miniature people menaced by a fleet of marauding, alien monsters. A wonderful sci-fi music score. Great fun throughout. Look for Richard Keil as a monstrous alien. Recommended.